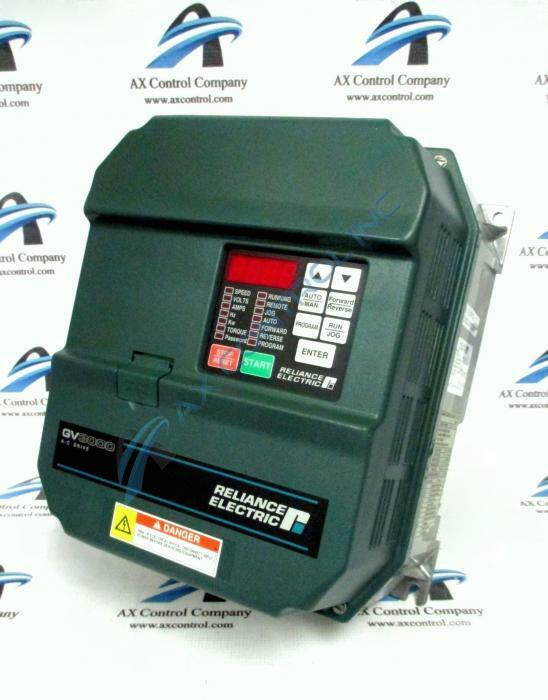 Reliance Electric GV-3000 GV3000/SE 7.5 HP AC Drive. What is the input KVA for 7V4160? 7V4160 has a 10.7 KVA input. What are the accel and decel parameters on 7V4160? The accel parameters on 7V4160 are parameter P.002, the accel time 1 (RAMP 1) parameter, and parameter P.017, accel time 2 parameter (RAMP 2). The deccel parameters on7V4160 are parameters P.002 and P.018. Parameter P.002 is 7V4160's decel time 1 (RAMP 1) parameter. Parameter P.018 on 7V4160 is the decel time 2 (RAMP 2) parameter. Where does output power wiring connect to 7V4160? Output power wiring connects to terminal U/T1, V/T2, and W/T3 on 7V4160. For output wiring on 7V4160, use a wire no greater than 12 AWG. How can I find the manuals for 7V4160? You can most likely find the manuals for 7V4160 on our website, but if you're having trouble finding the manuals, send us a request for 7V4160 manuals and we'll send you the links. Manual D2-3359 is the software manual for 7V4160 and Manual D2-3360 is the hardware manual for 7V4160. Both manuals cover 7V4160 in its entirety.